London, Jan. 14, 2019 (AltAfrica)-Growing economic crises in Zimbabwe has reached a boiling point after hundreds of Zimbabweans took to the streets of Harare Monday, protesting an increase in the price of fuel. The protesters said they wanted to force the government to address Zimbabwe’s moribund economy. Simbai Rice, one of the demonstrators, said the administration has failed to address increasing shortages of cash and basic food items. He said President Emmerson Mnangagwa had promised to rescue the situation when he took over from Robert Mugabe in November 2017. “The economy is off the rails. I wish the leaders would address the economy, especially fuel prices and for basic commodities, they should come down. People are not happy. My bus fare is now $5 from $1. I am now going on foot. If there is a way, he must return today and solve this,” Rice said. President Mnangagwa left Zimbabwe Monday to visit Russia, Kazakhstan, Belarus and Azerbaijan. He is expected to return home after attending the World Economic Forum in Davos, Switzerland. The forum takes place January 22-25. 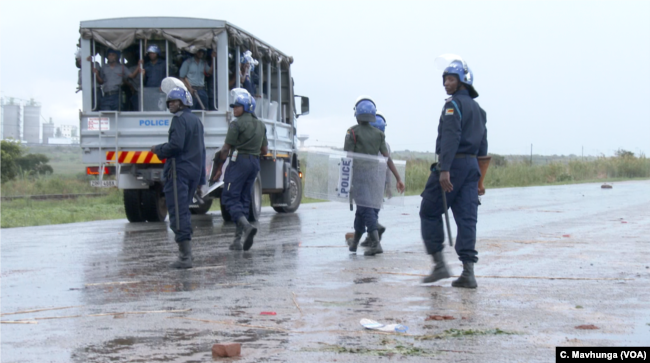 Police are seen deployed in Harare, Jan. 14, 2019, after protesters started blocking roads. On Monday, the army and police were deployed in Harare after protesters started blocking roads. Other protests took place in the country’s second-largest city, Bulawayo. Police in both cities fired tear gas to disperse demonstrators. The government says it is aware that prices have been rising, forcing many people to slide into poverty. 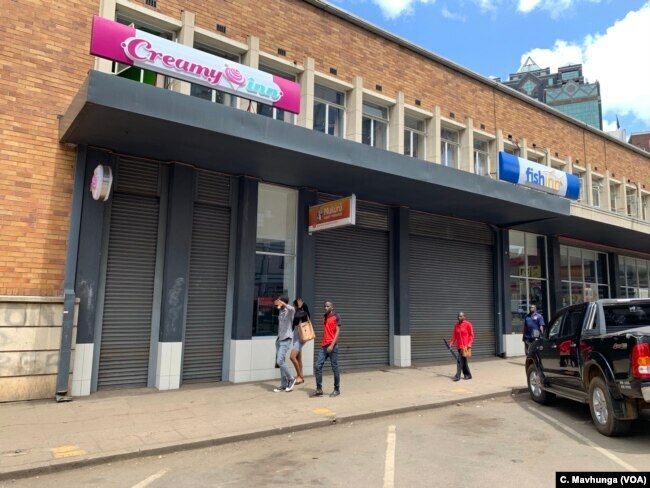 Most businesses in Harare were closed Jan. 14, 2019, as protests in Zimbabwe continued. Energy Mutodi, Zimbabwe’s junior information minister, said the government is doing all it can. “We are equally worried, just like any other citizen. There is nothing which the government can do to stop fuel price increases. In actual fact, we have been the country selling fuel at lowest price in the region. So what we are trying as the government is: the fuel prices have been adjusted upwards, we intend to ensure that the fuel supply is normalised,” Mutodi said. He also said the government cannot increase salaries for public workers like doctors and school teachers.